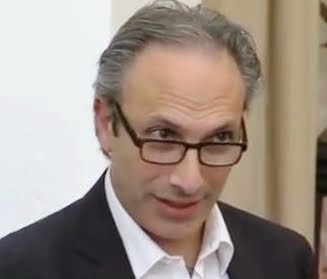 Development Horizons by Lawrence Haddad: The world is urbanising. So is malnutrition. Time to think differently. The world is urbanising. So is malnutrition. Time to think differently. This past week GAIN organised an event, in partnership with the Scaling Up Nutrition Movement (SUN) and the Global Health Centre at the Graduate Institute in Geneva, on urbanisation and nutrition. Both of these issues have been the subject of major international conferences in recent years. The second International Conference on Nutrition less than 2 years ago was a major rallying call for food systems to do more for nutrition, 20 years after the first conference in the early 1990s. Similarly last month’s Habitat III conference on cities was the first in 20 years. While there have been some voices calling for these two issues to come together, this has not really happened, although things now seem to be changing. Why has it taken so long? For a long time the centre of gravity for poverty and deprivation in many low income countries resided in rural areas. In the 1960s and 1970s Michael Lipton was writing about urban bias—policymakers focusing on their potentially troublesome urban neighbours but ignoring the more deprived but “out of sight out of mind” rural counterparts. As late as the 1990s we could see the massive resource mismatches in Mexico, with most anti poverty resources going to urban areas while most poverty was in the rural areas-this was a big spur to the redesign of Mexico’s social policy programs. But this picture is changing. 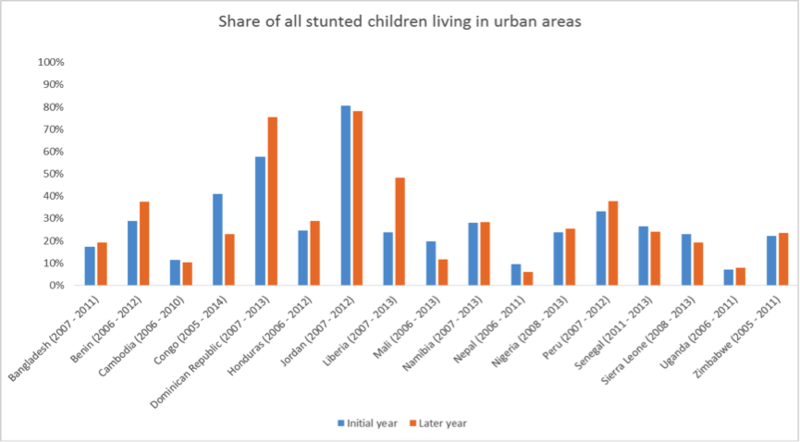 Poverty is slowly becoming urbanised, and, probably, undernutrition is too. I say probably because we don’t know definitively. We can track nutrition indicators over time but the designation of households as urban or rural also changes over time. A simple analysis I did with Natasha Ledlie of IFPRI and Tom Pullum of ICFI for the WHO-Habitat 2015 Global Report on Urban Health showed that in 9 out of 17 countries in the Figure below the urban share of stunting is growing, in 7 it is decreasing and in 1 it is constant. But the big game changer is the growth of adult overweight, obesity and diet related non communicable diseases such as type 2 diabetes. These are increasing faster in urban areas--in part due to the spectacular rise of the consumption of highly processed foods in towns and cities. A recent study showed that in 6 Southern and Eastern African countries, the consumption of highly processed foods among the lowest income groups in urban areas is almost as high as the consumption of these foods in the highest income groups in rural areas. Not all highly processed foods are bad for health, but many are: think of sugary drinks, high fat, salt and sugar snacks and fast food made with processed meat products. These foods are more available in urban areas due to fast food outlets, small and large supermarket chains and because adults have less time for food preparation—often they have to travel long distances to work, they have no cooking facilities if in slums and women work outside the home--these outlets are the most convenient, and often the cheapest. So what are the solutions? We certainly don’t need to completely reinvent the wheel—many interventions and approaches that work in rural areas will work in urban spaces (e.g. food fortification). But the opportunity to work with “new policymakers” in the urban space--food buyers for supermarket chains, mayors and municipal leaders, and collectives of opinion formers and activists who are powered by social media—may well create new policy and program intervention opportunities. We need to find these. To do this, we need to change our perspectives. Cities are places full of young people. 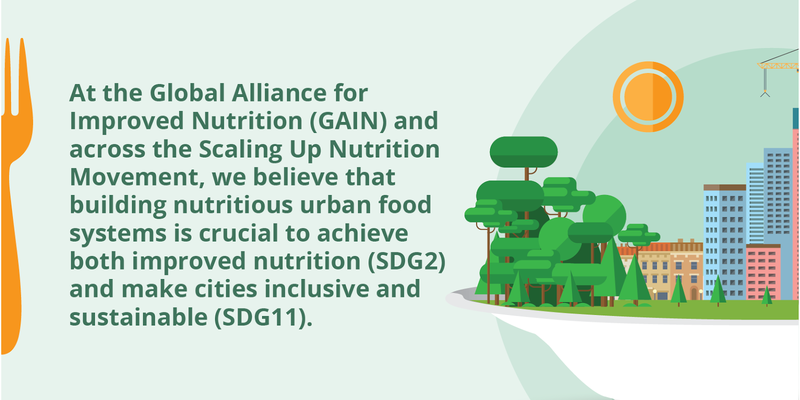 Cities can be drivers of growth and good nutrition for their residents and for the rural areas they are linked to. But those of us over 40 probably need to reorientate our thinking. We were brought up learning about--and experiencing-- rural development. But rural contexts are different: less market based, with more social capital and more security but with less political power. We need to engage the new policymakers in our alliances against malnutrition: they are the "unusual suspect"s we need to unlock the seemingly intractable nutrition problems. For example, how can we incentivise supermarkets to source not only more ethically produced foods but also more healthily processed foods (we have FairTrade, what about HealthyTrade)? How can we get mayors to care about human infrastructure as much as they care about building physical infrastructure? How can we get social media leaders to get their followers interested in food systems as well as political systems? How can we get the strong tech innovation hubs in cities to focus on disrupting food systems as well as disrupting car transport systems? Malnutrition in all its forms is driven by confluences of powerful forces: poverty, inequality, urbanisation and globalisation to name a few. To combat them we need powerful alliances of actors to come together to act. Urban spaces provide many new challenges, but also many new opportunities. We need to open our eyes and take them. thanks for posting very nice and informative information. That's it! We need to stand up with new approaches to combat overnutrition and its linked health threats through awareness raising at levels; in policy makers, traders, general population!